One of the things I love best about California is tri-tip. Advertisements may claim that the happiest cows come from California– but not these cows. These ladies got f**ked over pretty well– sorry, gotta have your tri-tip. Don’t know what that is? 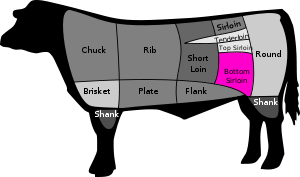 The tri-tip roast or steak (also called a triangle roast) is the 1 1/2 to 2 1/2 pounds of meat that sits at the bottom of the sirloin. The first time we had this was at a family cookout in Santa Barbara about 5 years ago. Thinly sliced, flavorful, unknown– at least to us. And later on a trip to Dry Creek Valley, we had this at the Wilson Family Winery. Sorry to say, Familia, Wilson’s tri-tip was better. First thing we did was look for it when we got back East. No luck. Crap– worse than that– blank stares. No more, the local Trader Joes now carries tri-tip. Made that little discovery just yesterday. Normally, I don’t buy my uncured meats at TJs (though they normally have a decent selection of charcuterie). Having never cooked tri-tip, but being proficient at most cuts of meat, I thought, this should be easy. I started with a dry smoked paprika based rub. But after a little internet research, I was reminded that not only does it have a rich flavor, but also tends to be lower in fat than most other cuts, meaning that it can dry out faster. A good marinade should be able to solve that little problem. But there it sat in the fridge with my dry rub all over it. Easy solution to that– I make a quick dressing of EVOO and cider plus red wine vinegars. Poured into a zip lock over the dry rubbed tri-tip, back to the chiller and we’re off to the mall for a quick Xmas Recon Mission. Arriving home, removed it from fridge and brought to room temperature before cooking. How to cook? You could roast this in the oven and that would be just fine. But grilling is so much better, right? Yeah, Baby. I know it’s December 23rd– but the temperature was mild enough to fire up the Ducane for what MAY be the last grilled meal of the year. But what the hell– the Winter Solstice was two days ago and the days are getting longer, right? Cooking tip– the key to getting this right is to get a high fire sear on the tri-tip before reducing the heat to medium low for slower cooking. Now normally, I don’t bother with this, but I strongly recommend use of a high quality meat thermometer inserted into the thickest part of the tri-tip to ensure proper cooking of this cut of meat. Whisk together the Marinade ingredients and pour over the tri-tip and refrigerate until 1 hour before grilling at which point it will be removed from the fridge and brought to room temperature. Remove the tri-tip from the zip-lock bag, but reserve the marinade liquid as you will use this to baste the tri-tip during the grilling. Sear the tri-tip and turn heat to medium-low. Periodically, turn the trip tip and brush on the reserved marinade. Once the tri-tip reaches a temperature of 155° remove from the grill and rest on a cutting board for at least 10 minutes. The temperature will rise a few more degrees and you should end up with a just medium cooked piece of meat. Cut the tri-tip across the grain into thin slices. Assemble your sandwich and dress with the carmelized vegetables. What to drink with that? Easy, we’ve got California on the brain– DCV, in fact. Can we drink anything other than a Wilson Wine tonight? I don’t think so. Critical considerations aside, the Wilson was a great pairing with the Connecticut Tri-Tip, though Ms. R received an education about the downside of 16% alcohol when she crashed on the sofa last night in the middle of Patrick Stewart’s performance in Dickens’ A Christmas Carol.